The car-free Ski to Sea relay race was so much fun last May, that I think we’ve moved into car-free eventing any time the race start is in our county. So this weekend, that meant my husband and brother-in-law teamed up for a car-free Bellingham Traverse. The multi-sport adventure race involves a 5.5 mile Run, 6 mile Mountain Bike, 18 mile Road Ride, 3 mile Trail Run, 4 mile Paddle, and finishes with a .5 mile Team Trek (a jog/run to the finish line). 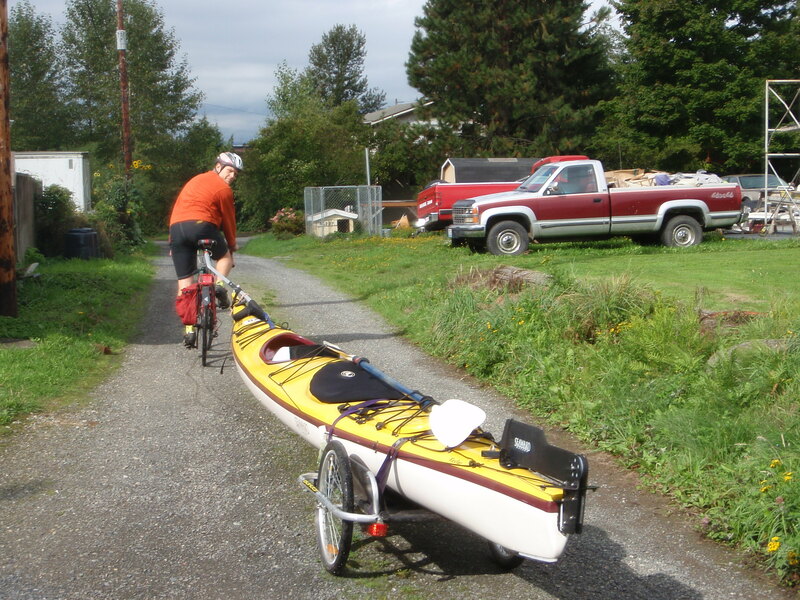 Thus there are a number of start lines, one of which the kayak must be towed to by bicycle, for example. The logistics become an entertaining pre-race planning aspect, and make for more community involvement too. That is, non-racing community members seemed entertained by Tom riding his mountain bike to Lake Padden while one-handedly pushing the road bike that Ben would use when he arrived from running the first leg. Or community members smiled to see me tandem bicycling my brother-in-law to the race start. Fun stuff, and outdoor adventure even for those of us not racing.